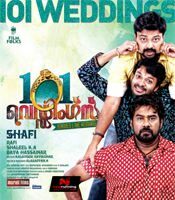 101 Weddings is a romantic comedy film starring Kunchacko Boban, Jayasurya, Biju Menon, Samvritha Sunil, and Bhama in the lead roles is directed by Shafi and written by Kalavoor Ravikumar. 101 Weddings are taking place together at one platform as part of a mass marriage ceremony. These weddings are organized by a women welfare organization. The brides and bridegrooms prefer mass wedding for economic reasons. The couples are asked to come and stay at a cottage to attend a pre-marital counselling session. Krishnankutty aka Krish (Kunchacko Boban), Jyothishkumar aka Jyothi (Jayasurya), and Antappan (Biju Menon) are also present in the function. They all belong to varied backgrounds. At a particular context three of them became friends. Though they were friends, three of them have their own distinct mannerisms and nature.